Donald Trump's picks for top administration posts have confounded many, but the president-elect says he has sought advice from experts on a number of positions. On Wednesday's 'Today' show, Trump revealed that he's discussed some potential cabinet nominees with President Obama. Trump said, "I would say that, yes, I take his recommendations very seriously and there are some people that I will be appointing and in one case have appointed where he thought very highly of that person, yes." The president-elect also noted, "I do like him. I love getting his ideas. And I may differ in many cases, I differ very greatly. In many cases I'm the opposite,"
Trump made similar statements during an interview with TIME, "We talked about some of the potential appointments that I would make. I wanted to get his opinion. And he gave me some opinions on some people that were very interesting to me, and that meant something to me. I believe in asking people." The White House has declined to comment on the conversations but has acknowledged some have taken place since the meeting immediately following the election, notes the Daily Mail. 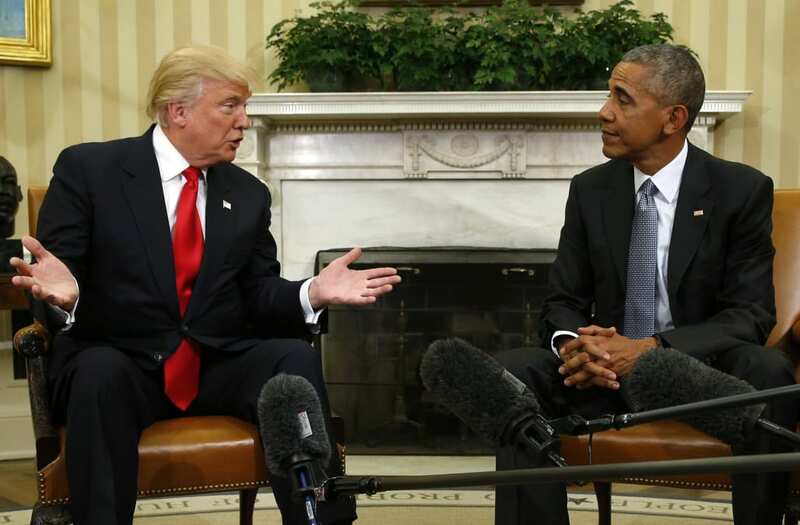 Following that conversation, Obama said to Trump, "I want to emphasize to you, Mr. President-elect, that we now are going to want to do everything we can to help you succeed because if you succeed, then the country succeeds."